If you've ever wished for the opportunity to help build quests, now is your chance. While all the building for the next few quests to be released is already completed, there are plenty more to come, and we'd love to include some of those awesome citizen skills we know are out there. The competition takes place on a separate world where you will have creative mode. You can get there from the portal just outside spawn in CVC, or from a portal in the "Special" section of Hub. You may only use this world to enter the contest, personal use is not allowed. You will have a 75 x 75 block plot to make use of. The build battle begins today, Friday October 5th, and you will have until midnight on Sunday, October 28th EDT to complete your entries. That is, you will have the day on Sunday to finish your builds, and it will end late Sunday night, Eastern time, the 28th. 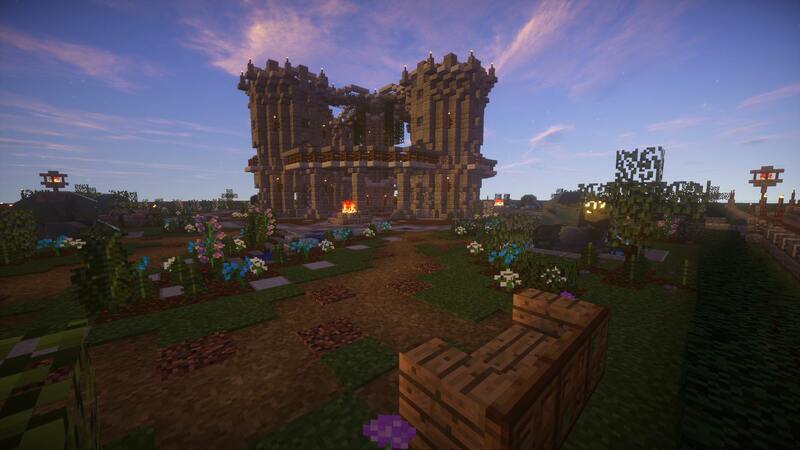 Build in a medieval-fantasy style. It can be pure medieval, or sway more strongly to fantasy, but it should be at home in a medieval-fantasy setting. One Plot Per Person and One Person Per Plot. Builds must be original, any found to be copied from other sources will be disqualified. Please contain all liquids, etc. within your plot, nothing from your build should be crossing your plot border. Do not build any persistent redstone devices (i.e. they run non-stop) or redstone devices that have an impact outside your plot. The creative world is not for personal use. CV’s offical building rules apply. Only items available in normal creative mode can be used in builds. Anything brought in from SP using saved toolbars being used in builds will result in disqualification. There will be 3 prizes for this build battle. Each winner will receive a trophy (custom head) and a 150 cube reward. The winners will be chosen in 3 categories: Citizens Choice, Staff Pick, and Quest Team Selection. The winner(s) of the Quest Team Selection award will be invited to join the quest team in building our server quests, in addition to their trophy and cube prize. Citizens Choice: When the competition is closed Sunday night, a forum thread will be started where you can enter your votes. Players who wish to vote should consider all builds in the competition and cast votes for their 1st, 2nd, and 3rd favorite builds. If you want your vote to be anonymous you can forum PM it to myself, Saemai, instead. You will have 1 week to vote from the time the thread goes up. Please attempt to see all builds before placing your vote so you can make a fair judgement, and vote for the builds you truly think are best for the competition, not just because they are your friends. Anyone who wishes to vote but is unable to do so over the forums should contact Saemai via Discord, or any A+ in-game. Staff Pick: Staff will vote in their own thread, with the same time limit and guidelines as the Citizens Choice vote. Quest Team Selection: This vote will be made by a small panel of key members of the quest team. It consists of SAs, Admins, and Smods who play an involved and important role in the creation of quests on our server. It also has the same time limits and guidelines as Citizens Choice. If you wish to enter the contest, place a modreq in the build world and staff will create a plot for you. Once your plot has been created you can enter and leave the build world at will for the duration of the competition, once you're in the build world the /home command will take you to your plot there. Will staff be competing too? No, staff members already have the option of joining the quest team, so they will not be allowed to participate in this competition. If I win, will I get to know all the quest secrets!? No, you will not. In fact, we make an effort to keep knowledge of quest specifics to a minimum amongst staff members, as well. We do not want any player having an unfair advantage over others when it comes to obtaining ranks. Most quest world building, even for staff, takes place off-world, and is pasted in afterward. No, there will be 3 separate 1st place winners. Should you win in more than one category, you will be given an honourable mention in the second category, but 1st prize will go to the person with the next highest score. If I miss the start date, can I still enter? Yes, you can get a plot and begin building at any point within the time frame. You will still need to have it completed at the same time, so the later you start, the less time you will have. What happens to the builds? Once the build battle is completed, you will no longer have access to build. However, you’re more than welcome to visit and go sightseeing after building and voting is completed. The world will remain accessible by portal, although the portal shall be moved to hub or Skylands after the event. OMG this is sooooo cool.. Thank You All. I'm assuming since the theme is so vague, the winning builds will just be something pretty on the side and not part of the storyline but could we get more details on the location and specific theme of the location? Like, should I build something more village-based or castle themed, or forest and ocean builds etc? Correct me if I'm wrong, but I think there is a misunderstanding. The builds in the competition are not necessarily for the quest world, but an opportunity to join the quest team. So we're not looking for anything specific, it's a build battle of skill and execution, and it can be anything along the theme you wish to build. If you are invited to join the quest team as a result of the build battle, there will be many building opportunities ahead for quest world, not just this one thing. Hopefully that clears things up? Is working with other people (as a team themselves) allowed? Not 50 people, but maybe 2-3? Not for this particular competition, sorry! It is one plot per person, and one person per plot. (10-05-2018 11:01 AM)saemai Wrote: Can I win more than once? So to clear this one up: If you win the citizen or staff vote, you are still eligible for the quest team, correct? And if you are selected, the 2nd place person in the other category will win the prize? Yes, if you win the Quest Team Selection and another category, you will get the quest team selection, then an honourable mention in the other category. It goes Quest Team Selection > Citizens Choice > Staff Pick. Does that make sense? Ok, so we have 3 weeks and 2 days all up. Well 1 day now. Omg I love Mid-evil houses even though I am not the best at making them. Omg I’m gonna enter as soon as I have time to get on! What happens if 2 people tie on votes, or more? would staff decide which looks better? (10-25-2018 08:29 PM)SushiPanda789Forum Wrote: What happens if 2 people tie on votes, or more? would staff decide which looks better? iirc, last BB, both people who were tied got the prize, not sure though. oh i hope that will hapin! that way more people have a chance!